Flat and sheltered as far as the eye can see! The Bad: There are two floors and if there is an elevator, we did not find it. The Grand Hotel Europe on Nevsky Prospekt – The Good: A gorgeous lobby, and elevator to the Mezzanine location of the relatively inexpensive and very attractive Mezzanine Café, or the elegant but pricey Caviar Bar. Recommend: the Caviar Bar Appetizer menu and a cocktail for your last-night splurge. The Bad: Must get on the right elevator to descend to the ground floor, or face elegant but slippery marble staircase. Two appetizers and two cocktails at the Caviar Bar ran us close to $100 US including tip. The Mariinsky Theatre (formerly known as the Kirov under the Soviets): The Good: Beautiful theatre, only a few steps to seating on the ground floor. Just looking at the baroque interior is entertainment; the world class opera and ballet is a bonus. The Bad: Ladies room is down a steep flight of stairs; no visible elevator. 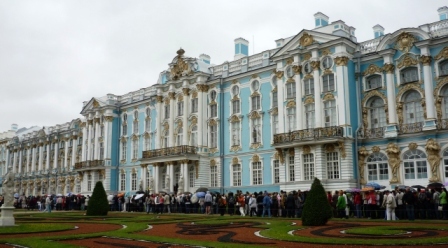 The Hermitage Museum – The Good: Wheelchair service gets you royal treatment from tour guides and tourists alike. Elevators are available – only to wheelchair users and pushers. Unbelievable art hung in an amazing baroque palace. The Bad: Only two restrooms, at very beginning and at very end of tour. Need 60 hours at least to really appreciate all that is here; our tour took 3 hours. Still 3 hours of wonderful is better than none! Peterhof: – The good: miles of wonderful level strolling paths in a garden fantasy of fountains, pools, pavilions, and statuary. You enter at the top of the Grand Cascade; there is a ramp entrance down to the right in the direction of the Pagoda Fountains. (If you miss this ramp, the staircases down at the middle and the far side are VERY long.) Lots of benches for sitting and admiring. 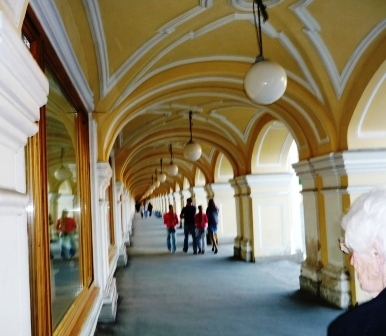 The Pavilions were Peter the Great and his Catharine took refuge are charming and much as they might have been in Peter’s time. Catharine’s Palace: the Good: the exterior of Catharine’s palace is lovely – if you like Wedgwood china you will love the effect of white and gilt trim on blue. The Bad: the line for seeing the interior of Catharine’s palace is very long. I’m sorry we missed this, as friends had told me the Amber Room is a DON’T MISS, but it was starting to rain, the wind was picking up, and we lost our nerve. Pushkin – the Good: The school where Pushkin studied is very evocative of the life of aristocratic young scholars – lots of fascinating artifacts. The Bad: NO ELEVATOR, and a brutal spiral staircase thronged with Russian school children on field trips. Also almost no benches for resting between ascents. Pushkin’s room is on the 4th floor (effectively the 5th). We got only as far as the 3rd floor; I couldn’t force Mom’s bad knee any higher.